- Parker Dam Fall Festival and Pumpkin Float, Parker Dam State Park, Penfield, Saturday starting at noon: The leaves are really starting to turn, making the drive from State College to this beautiful state park near Dubois part of the attraction. This event features, vendors, a variety of games, apple cider, a costume parade and trick-or-treat, a beach bonfire, and pumpkin float on the lake. For more information, please see their flyer here. - Harvest Fest at the Winery, Mt. Nittany Vineyard & Winery, Centre Hall, noon to 5:00 p.m.: The Mt. Nittany Vineyard & Winery will hold its Harvest Festival at the Winery on Saturday. Stroll through our mountain side vineyards and enjoy complimentary wine tasting in their charming, chalet-style tasting room. Sample and purchase food items from local food vendors and enjoy hot-off-the grill sandwiches and sides from Hog Father’s Old Fashioned Barbecue. Food vendors include: Goot Essa Cheese, Clover Creek Cheese Cellar, Gemelli Bakers, Tug Hollow Honey, Chocolates by Leopold, and Piper’s Peck. - Fall Festival, Downtown State College, Saturday starting at 10:00 a.m.: It’s a bye week for Penn State football, but the State College Fall Festival gives you a reason to trek to State College this Saturday. The Fall Festival takes place on the 200 block of Allen Street downtown, and features a bounce house, pony rides, climbing wall, the Happy Valley Dessert Contest, and a community resource fair. To learn how to enter the dessert contest and more information, please visit the Downtown State College website. - Bellefonte Fall Festival and Halloween Parade, Talleyrand Park, Saturday 11:00 a.m. to 4:00 p.m.: Nothing beats a Halloween parade, and Bellefonte is offering a parade full of ghosts and ghouls. There will also be live music, children’s activities, and some local food. Go to their Facebook events page to learn more. - Way Fruit Farm Apple Festival, Stormstown, Saturday 9:00 a.m. to 4:00 p.m.: First off, apple cider: that’s enough in and of itself. But the Way Fruit Farm Apple Festival also features pick your own pumpkins, a craft show, local food, children’s activities, an apple sling shot, and more. 10% of the proceeds from the festival benefits the Rose of Sharon Orphanage in the Dominican Republic. Learn more at their Facebook page. 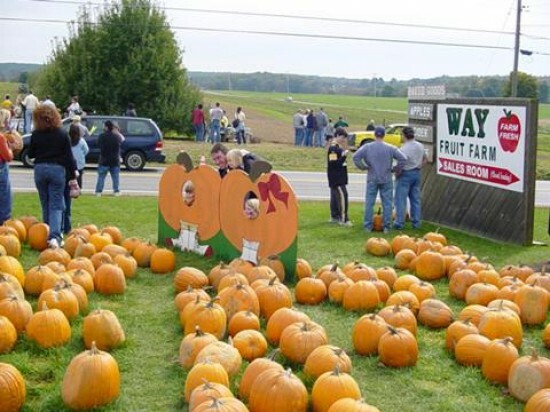 - Wasson Farm Market Fall Fest, State College, Saturday and Sunday starting at 10:00 a.m.: Hayrides to the pumpkin patch to pick a pumpkin ($6 for any size pumpkin), mums, and gourds and pumpkins available at the market. They will have soups (chicken corn, ham and bean, and beef vegetable) for sale along with homemade apple butter.